Vaccon's air-powered venturi vacuum pumps are highly efficient, capable of reaching 28"Hg [948mbar], dirt tolerant, and include a silencer for quiet operation. 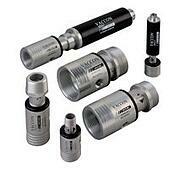 Lightweight and compact, they can be easily mounted close to the vacuum point for fast response. By nature, vacuum pumps draw in the atmosphere in which they operate in. Any debris, dirt and/or dust in the air will be drawn through the pump. Whether your application is carton erecting, pet food bagging, sheet feeding, or any other application, Vaccon pumps operate continuously without maintenance or vacuum filters that can clog, degrade performance, cause downtime and increase costs. The VDF Series is a unique Vaccon innovation that places the vacuum port and exhaust path inline making a straight-through venturi vacuum pump. These compact pumps offer high flow rates up to 120 SCFM [3400 LPM] and high vacuum levels up to 25”Hg [847mbar]. Developed for extremely dirty and dusty environments such as foundries, refractory and bagging operations, VDF pumps don’t clog, lose suction or require a vacuum filter. Standard VDF pumps are field-adjustable allowing you to regulate the vacuum flow and vacuum level to meet your application requirements. This maximizes energy efficiency by consuming only the compressed air necessary to do the job. A pressure regulator is not required as the pump can be tuned to operate at any pressure above 50 PSI [3.5 bar]. The DF pump's unique capability to create instantaneous vacuum flow and high air velocity, combined with its straight-through, smooth bore design allows material to pass directly through the pump at high speeds without interference or clogging. 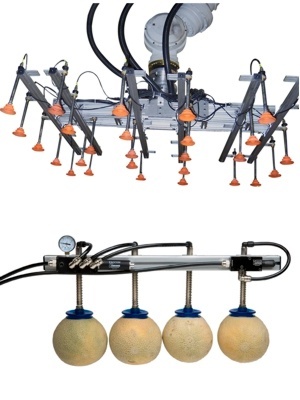 Simply regulate the input pressure to adjust and control the transfer speed. For maximum efficiency, the compact design allows close placement to the work area. DF Series material conveying pumps are made of anodized aluminum and available in 17 standard models with inside diameters from 1/8" [6mm] to 4" [100mm]. As is true in most vacuum applications, there is more than one correct answer. 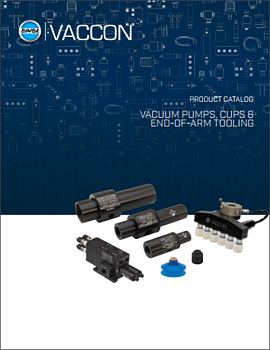 Depending on your application, sizing a vacuum cup and pump may require some trial and error. This is why Vaccon offers a 30 Day Test & Evaluation program. 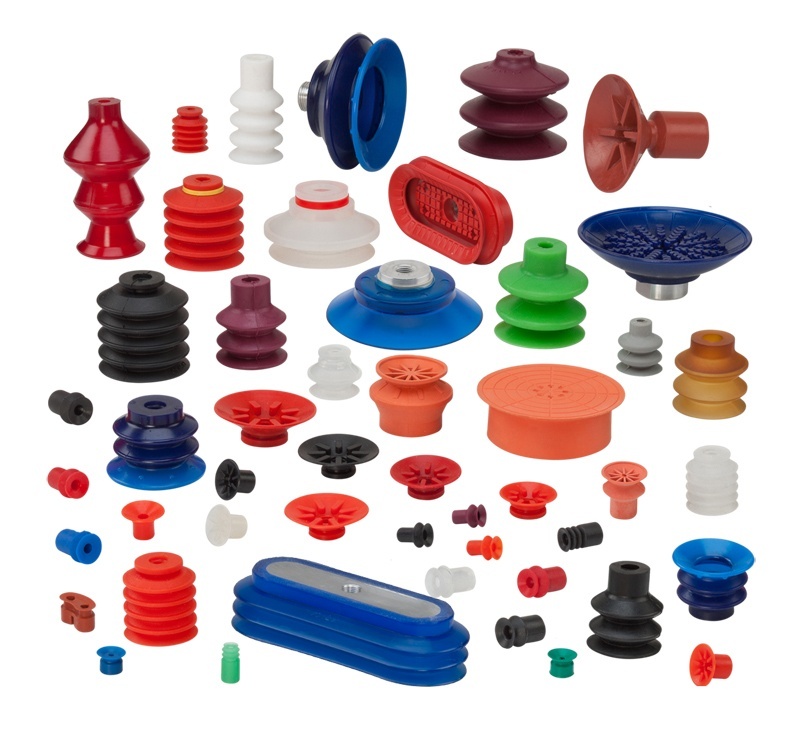 If you don’t have the time or resources to test products yourself, we recommend that you send us a sample of the product and we will size the cup and/or pump for you. With our in-house video studio, we can email short videos and/or digital photos of the product in action with the properly selected vacuum cup and pump.. Separate EOAT Components: Build your own tooling with simple erector-set connectivity. Interested in a Vaccon product? Find all of Vaccon's videos on their YouTube Channel.